What exactly is involved in disputing a withdrawal on your account? The purpose of this case study is to give a detailed example of the tasks involved. 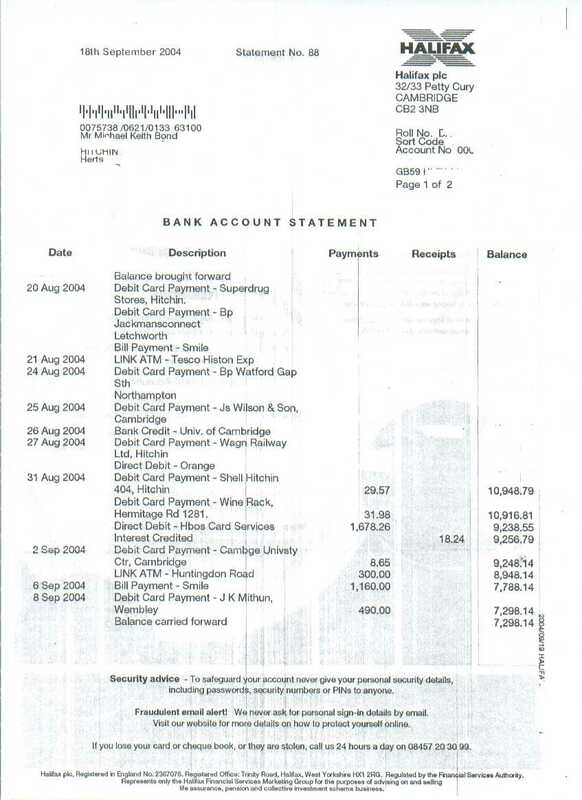 In September-October 2004 I was a victim of credit and debit card fraud, and I took the opportunity to document the dispute resolution procedure, to serve as a guide for others. Whilst procedures vary across banks and procedures within banks change over time, this description should serve as a rough guide as to what is involved in disputing a transaction. 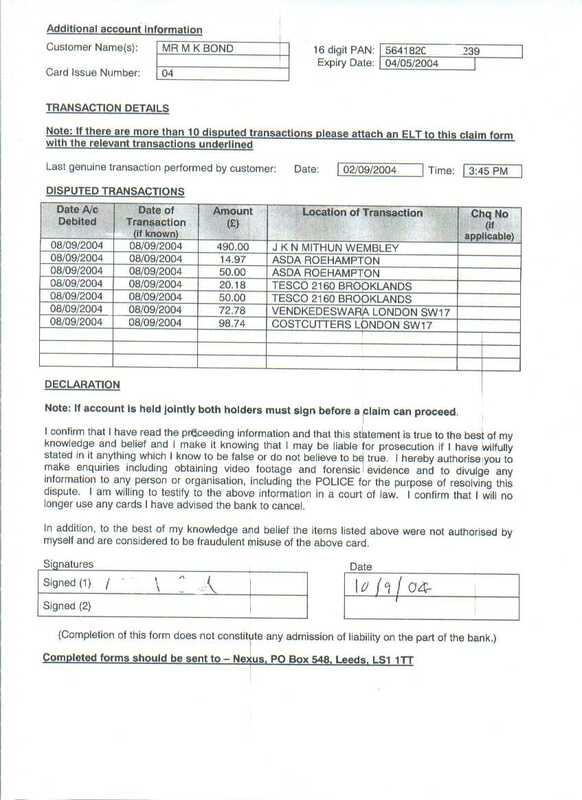 This case is not a proper "phantom withdrawal", because the perpetrators did not make use of a PIN; a copy of my card was simply used fraudulently to buy goods and obtain cashback. Such fraud cases are extremely common, much more common than "phantom withdrawals". However, from the perspective of the customer, the dispute resolution procedure is roughly similar, so this is why I have documented this case. This page is still under construction. The first half of the story is described in detail. The rest is described in bare bones, and the detail is to come soon. This "phantom withdrawals" site was not started in response to my own fraud experience described here. As noted from my webpage I am a researcher in this area, and had been maintaining a site on phantom withdrawals for some time before I myself experienced fraud. Card issued. PIN issued. PIN memorised and mailer destroyed. PIN never changed. First fraudulent transactions are registered on my account, taking place at superstores . I remain unaware. 11am. 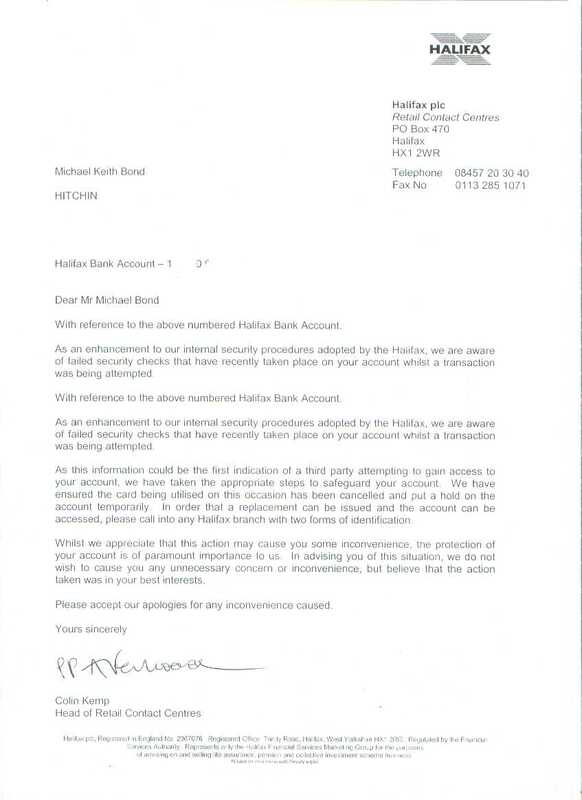 I receive a letter purporting to be from the Halifax, informing me that their intrusion detection had spotted abnormal activity on my account. 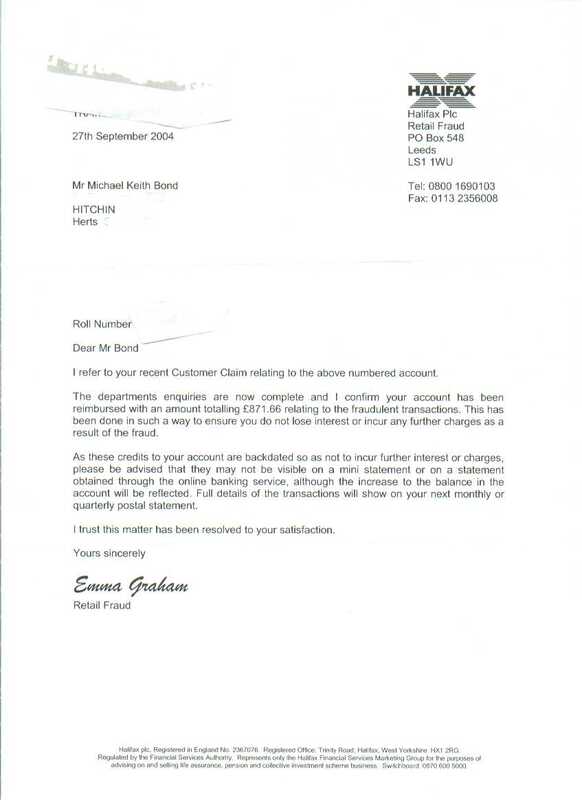 The letter is not produced to a high standard -- the first two paragraphs are repeated, and the heading refers to my bank account in an unusual way, using sort code and account number, rather than roll number. I phone Halifax telephone banking, ask if they have a record of this letter being sent. They have no record of letter, but do note that my account is blocked. They read out a list of recent transactions and I identify some that I don't recognise. I tell them to maintain the block on the card. I ask the manager how I can be sure that my card has been cancelled and that no further transactions can be made. She demonstrates that the card has been blocked by bringing up a message box on the computer that says "Card is Blocked". I ask her for written confirmation that the card is blocked and that no more money will be debited from my account. She cannot provide this confirmation, so as a precaution I clear the balance of my account. I withdraw the maximum available amount in cash, and call my telephone banking service from the office, and ask them to transfer the rest electronically to an account with a different bank. 1:30pm. I decide to make sure that any CCTV footage of the disputed transactions is preserved in the event the case goes further. I ring up Asda and Tescos information lines and locate the stores in question, and retrieve their telephone numbers. Surfing the internet, I learn that "J K Mithun" is a jewellers. I phone Asda and seek to learn how long they keep their CCTV footage on file for, and likewise their till receipts. I learn that they will not release either except to investigating police officers. I phone Tesco's and ask about their CCTV footage retention period, as well as receipt storage. I speak to the security manager at the store who is very helpful. 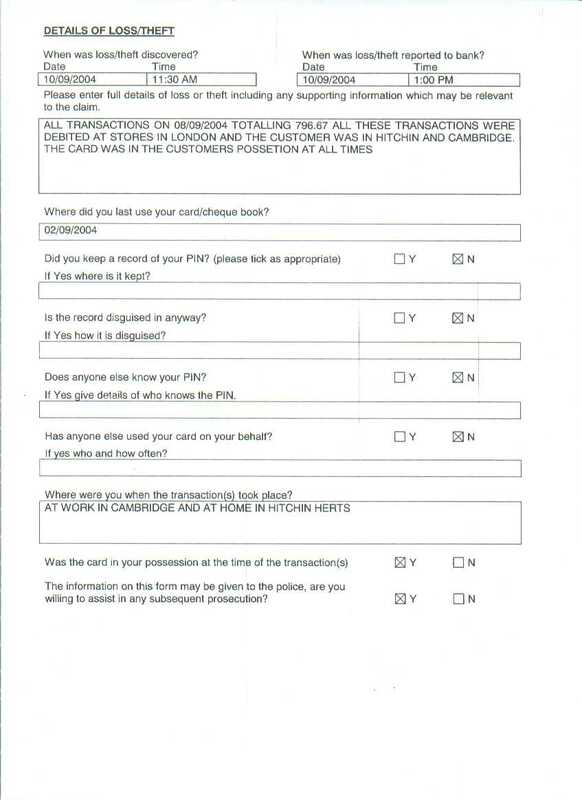 He says he cannot release a copy of the signature slip to me without authentication that I am really the genuine cardholder (to prevent criminals from using this as a method to discover signatures), so asks me to fax a sample of my signature that he will compare against the till receipt. I set out to my workplace in order to use the fax machine. Before I have a chance to submit a sample signature, I am phoned back by the security manager, who has retrieved and watched the CCTV footage corresponding to the disputed transaction. He recounts observing two aisians using a card to purchase drink and cigarettes before claiming the maximum possible cashback. As I am caucasian, the CCTV footage clearly indicates that the transactions were not made by me. Furthermore, as far as the security manager is concerned, this is a classic case of fraud: buying easily re-sellable products such as drinks and cigarettes for the purposes of obtaining cashback. 3:30pm. I report the incident to the police by telephone and am allocated a provisional crime reference number. 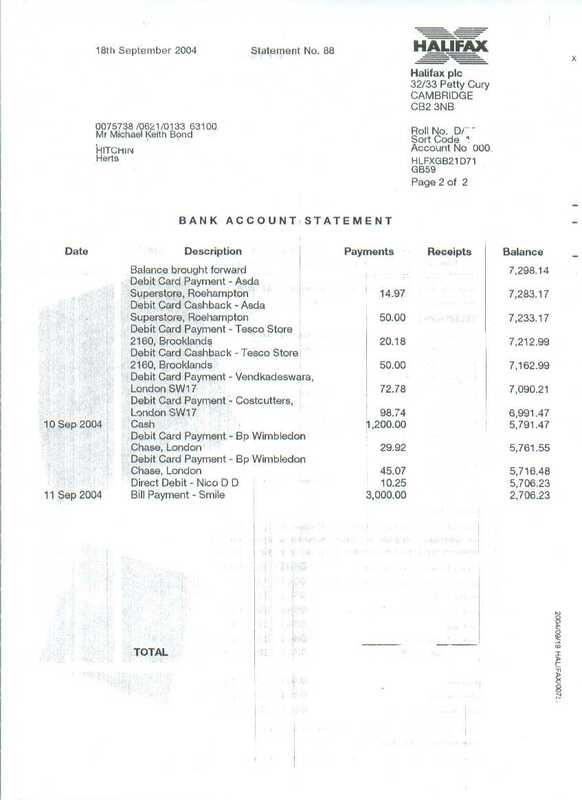 Seeing as the fraud took place in london I am later allocated a reference number by the Metropolitan police. 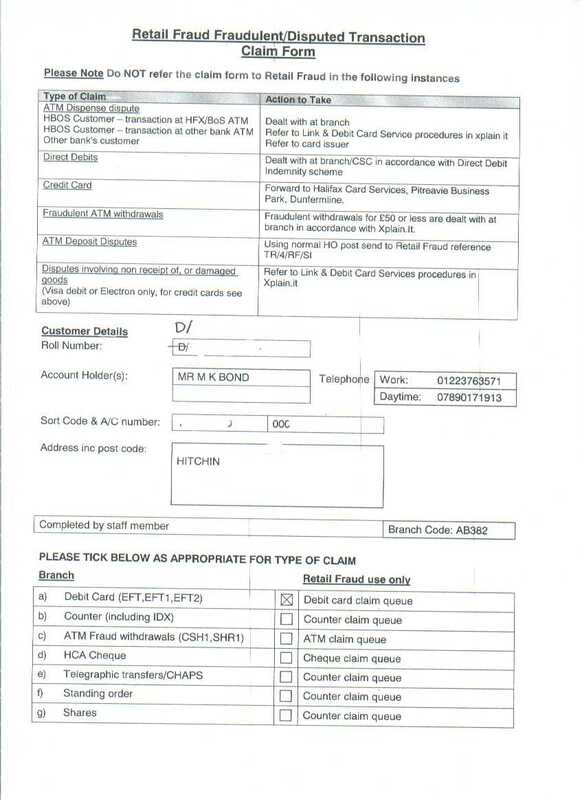 My bank statement dated 18th December arrives, showing the disputed transactions. I have deleted various fields on the statement for my own privacy. I receive a letter from my bank informing me of their decision to make a full refund.